Learning how to tie shoelaces is one of those little things in life that seem easy to other children but to our dyspraxic kids it’s a huge challenge. But never fear, there are more ways to deal with this problem than you probably think. We’ll take a look at five different ways to teach shoe tying that are very accessible to kids who are fine motor-skills challenged, and how we can get around the problem until they nail it. Because they will! It will take them longer than others, but they will be able to do it. So let’s learn how to tie laces like a ninja! This seems to be the easiest way to teach a child to tie their laces–my daughter is almost there with this method after only a few attempts 🙂 . There are no complicated instructions; it’s just a question of practice and remembering each small step. Go take a look! This cheeky little method just sneaked its way into the article as a new way to tie laces. Well, it’s new to me. So new that I haven’t tried it yet so I can’t comment on how effective it is, but my goodness it looks soooo much easier. It basically involves tying up the laces backward and ending up with two loops that you simply pull to tighten and then cross through each other, twist and pull again. I really can’t wait to try it. This shoetying method is broken down into easy steps, and requires you, as the teacher, to do a bit of preparation. So you can either colour in or mark dots on one side of the lace, and make a knot on the other side. I like the idea that there are recognisable visual clues–great for dyspraxic kids. Her presentation is best for younger kids, but I love her enthusiasm. She also recognises that as soon as the child gets fidgety that it’s enough of a lesson for the day, and that no child is going to learn how to tie shoelaces in one lesson. I saw this same method a few times on different videos and it looked way too complicated when it was broken down. However, I think this video is the best one at showing it simply. There’s no way I’m doing it in 1 second though! I haven’t tried this shoetying method with my little one yet as she’s getting on well with the first video, but it’s another classic way to do it. On the face of it, it looks easier than the traditional way, but hey, my mind doesn’t work in the same way that a dyspraxic child’s does. It requires tying a half knot to begin, making a loop from each lace (so they look like bunny ears), and then tying the loops together. You don’t need any added hurdles when learning how to tie shoelaces, so start with just one shoe that your child isn’t wearing. You can then position it wherever is comfortable for your child. You can try and make the whole shoelace-tying lesson more fun by using some props. We use the Melissa & Doug wooden shoe for our practising, as it’s a bit more robust for practising and you don’t have to worry about nasties on the bottom of shoes getting germs onto the carpet or your kids hands. You don’t need to buy extra stuff though. You can draw the outline of a shoe onto a piece of card, use a hole punch to recreate the eyelets on a shoe, and use a spare shoe lace threaded through the card. This is a nice portable idea that doesn’t take up much room too–always a bonus! 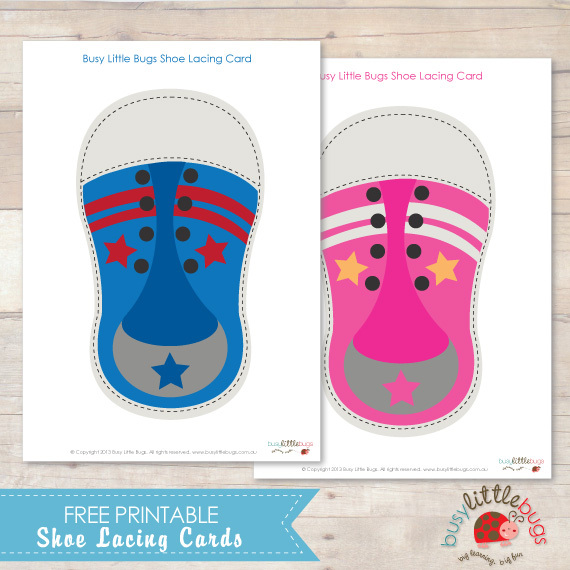 There is a nice shoe-tying card download that you can find here. 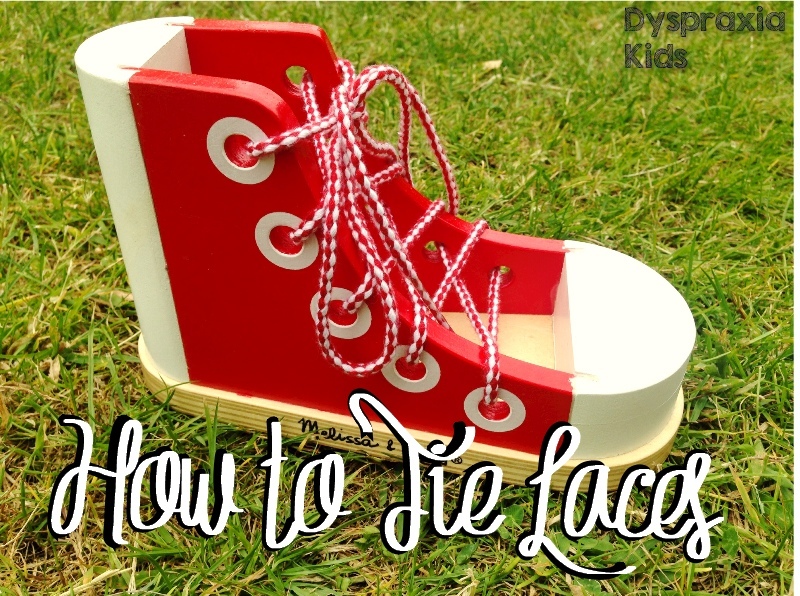 I’ve also heard that using pipecleaners to practice with (in the shoes instead of laces) is a good idea. The pipecleaners stay in place much better so it cuts down on frustration while your kids practice. So what happens if your little/big guys still aren’t getting it? Don’t panic. You are not alone. Once your child’s feet get bigger, it’s likely that finding shoes and trainers that do up with velcro is going to become increasingly difficult. And learning to tie their shoes isn’t going to happen overnight, so what do you do? You can buy these from Amazon, but a lot of sports shops stock this type of lace too. We have these in a pair of my daughter’s trainers. She finds the shoes difficult to get on sometimes, as the elastic is so strong so it’s hard to pull the tongue down or get much room to squeeze the foot in. She initially struggled with having enough strength to press the ‘unlock’ button, but after a few months she’s getting the hang of it. But, although Mummy found them challenging to initially fit, little one now uses them very easily. You really just need to pull them on both sides until they are tight enough, and the coil shape keeps them in place. I love your post! My name is Charisse Torres, a pediatric occupational therapist and a certified learning disabilities teacher consultant. You highlight using pipe cleaners as a tip, which has often been a “go to” strategy in therapy for me and other therapists alike. Have you heard of Memory Ties? These are training shoelaces that share similar properties to pipe cleaners, with a safer and more kid friendly architecture. It has been dubbed the “secret weapon” to learning how to tie shoelaces and are amazing for children with dyspraxia! See more at http://www.memorytieslace.com.